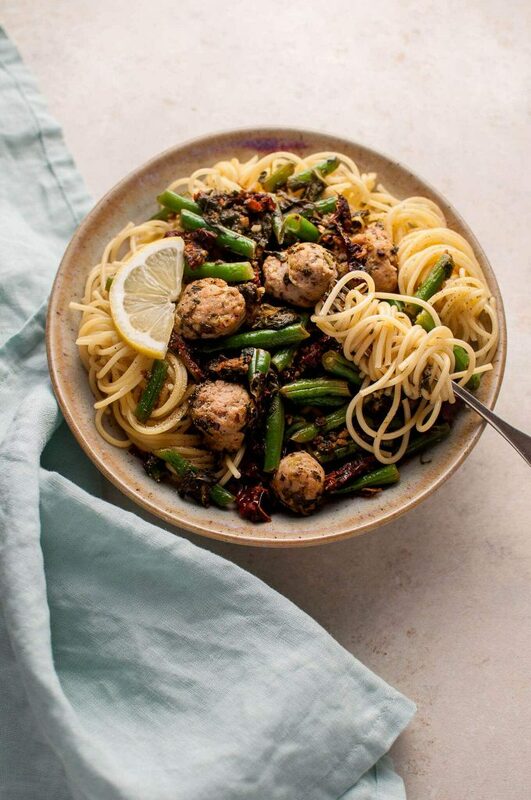 This healthy chicken sausage pasta with spinach, lemon, and green beans is healthy, full of flavor, and filling! Ready in less than 30 minutes. I don’t know about you, but I need food to actually taste good. It’s probably obvious by now, but I’m totally not one of those “food is fuel” type people. I believe in eating healthy most of the time, but I need my healthy food to taste better than cardboard. If you still want your pasta and a bit of meat but you don’t want to spoil your new year’s resolution, this dish is for you. It doesn’t take long at all to throw this dish together, and you can feel pretty good doing it. 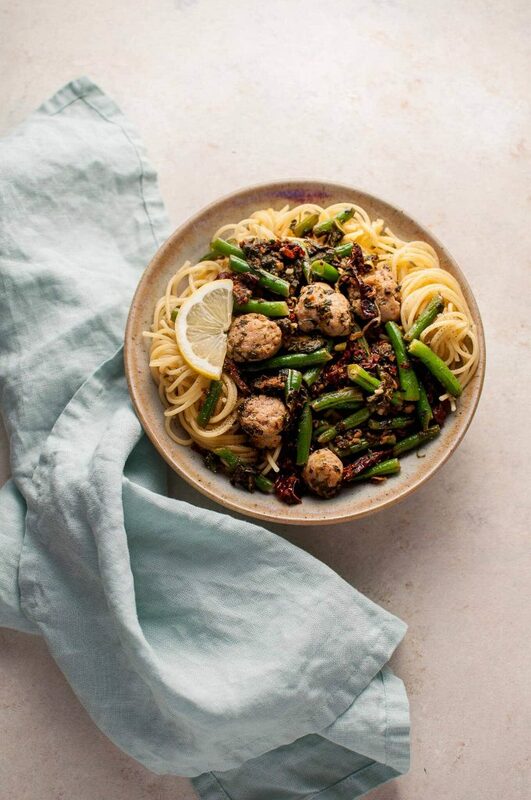 I hope you enjoy this healthy chicken sausage pasta! 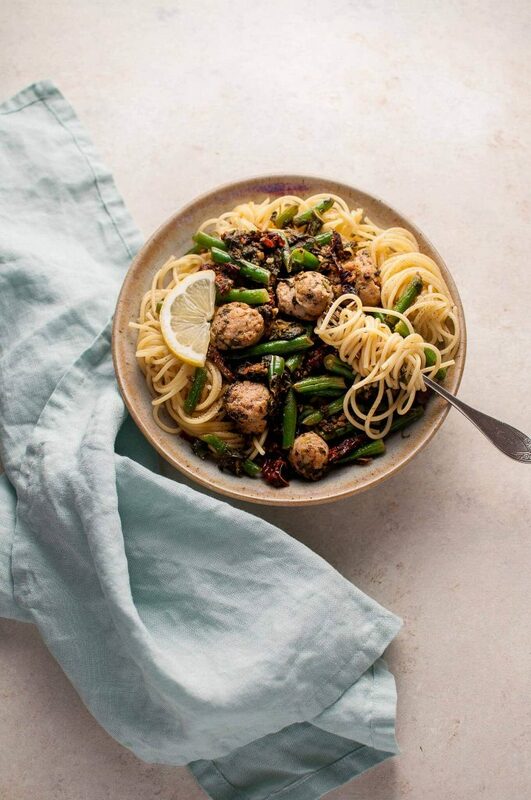 This chicken sausage pasta with spinach, lemon, and green beans is healthy, full of flavor, and filling! Bring a salted pot of water to a boil and cook pasta (I used spaghetti) according to package directions. Warm the oil in a skillet on medium-high heat then add the sausage and brown for 8-10 minutes. Reduce the heat to medium and add the spinach and beans. Cook for 5 minutes. Add the lemon juice, garlic, Italian seasoning, red pepper flakes, and salt & pepper if desired. Cook for another two minutes. Add a couple of tablespoons of the pasta water to the skillet prior to draining the pasta. Drain the pasta and toss it with the sauce. Serve immediately. 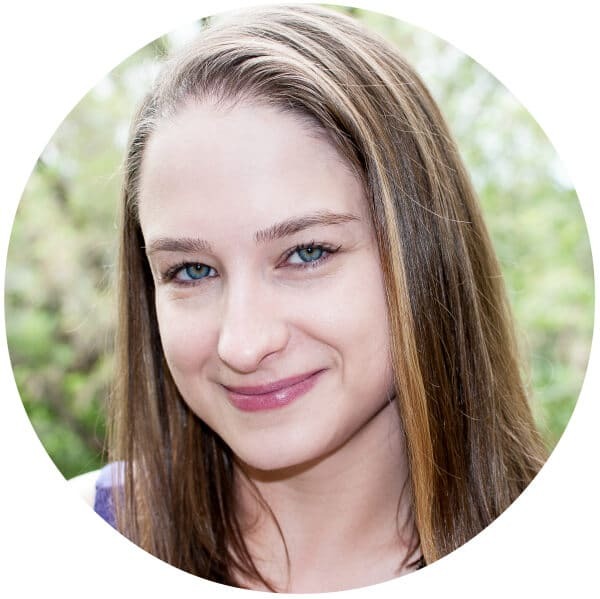 *I used three sun-dried tomato and basil flavored chicken sausages that weighed 16 ounces. You may also like my healthy 20 minute turkey bolognese recipe or if you’re a fan of chicken sausage, you may like my chicken sausage pasta with roasted tomatoes. Can you make a vegetarian version? Except I don’t like green beans or cooked spinach. Can you make something better? Lol, your sister has a funny sense of humor 🙂 This looks and sounds fantastic, Natasha! And your photos are gorgeous, as always! I love finding easy and delicious weeknight meals. This looks so yummy and perfect to whip up during the week when I have two crazy toddlers running around under my feet! They will probably even like it too if I leave out the red pepper flakes. Yum! I don’t know what I like better…your sister’s comments or your replies to her comments! Ha!! I love the green beans and spinach. And good idea to sub in the chicken sausage! Nice and healthy! Thank you, Mary Ann!! Haha yes, we’re silly. This looks so yummy! I’m the same way as you, even if I eat healthy, my food has to TASTE good. Adding this to my menu asap!